This site is for cat lovers! There are games, fun things to do, and you can even send an e-card! I have five cats who let me live with them - Bea, Sweety, Emmy, Stripes, and Ibi! There are videos and lots of photos. I'll be adding more pictures and videos of my cats - all cats I rescued as stray kittens in Tucson and Oro Valley, Arizona! I've kept this site up in memory of my beloved little girl, Sunshine. So, the pages are written from Sunshine's point of view! She was very intelligent - she even knew how to create websites! I love you, My Lil' Sunshine Kitty! I want to urge you not to have your cats Declawed since it causes biting and other behavorial problems for your poor, confused cat because it mutilates your cat by amputating the first joint of a cat's toes! There are alternatives to declawing that save your furniture. Please read my page about alternatives and reasons why declawing is cruel to your cat! Please come back! Thank you! Hi, I'm Sunshine. Welcome to my home page! I live in Tucson, AZ, with my meowmie, Linda. We have a fun time there. I'll be putting up more pics of them in My Family page! Here's a video of me "leaping" - just like the music playing! Click on the words YouTube to see the video better! 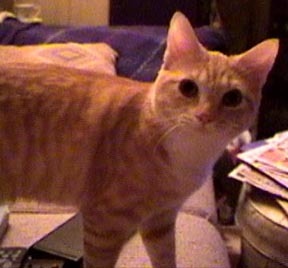 See other longer videos of me on Sunshine's Story page and Sunshine's Sports page! Find out all about me and what I do - like how I was rescued from "life on the streets" and other harrowing experiences (like getting shots and spayed)! If you want to exchange banners, join cat clubs, visit other cat websites, or get information about caring for cats - please visit Sunshine's Story, Banners, Memfurships, Sun-Links, and Webrings pages. You might also be interested in seeing the pages I made for two cat clubs I belong to: CLAW and Purr Scouts. I also have a lot of fun things to do here, like playing games! You can save lives by adopting cats from the Humane Society of Southern Arizona. 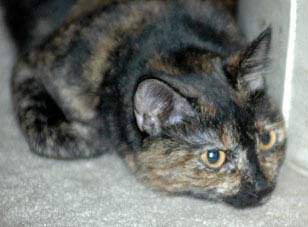 If you have room for a loving companion, please go visit the Humane Society in your area to adopt someone just like me! Thank you!! 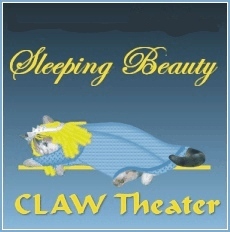 I'm in CLAW Theater's Sleeping Beauty. Click the sign to see that and other great plays at CLAW! Please e-mail me before you leave (since my guest book has been retired)! Since this site is always under construction, please leap back again soon! Sunshine's Site was created on July 27, 1999. Website design, graphics, videos, photos, and artwork are by and the property of Linda Bennett. Other graphics are the property of their credited owners. Images are not allowed to be displayed in any form on other web sites or on the web in general without permission from Linda Bennett.